Blog - More Millionaires Than Ever! Does Trump Get The Credit? 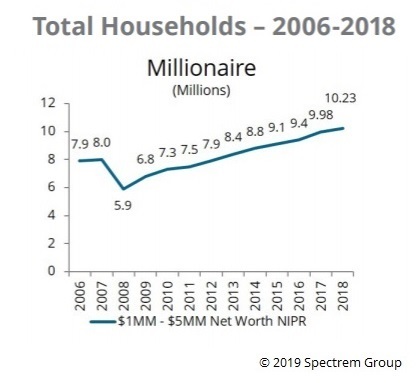 In case you missed it, Spectrem Group released its annual Millionaire market sizing this past week (See Spectrem Group’s Market Insights 2019), and found that at the end of 2018 there were 10.23 million Millionaires in the U.S. This the tenth year that the number of Millionaires has increased although it is at a somewhat slower pace than previous years. Additionally, Spectrem identified 173,000 households with more than $25 million of net worth, 1.4 million households with more than $5 million of net worth. There are approximately 31.2 million households with more than $100,000 of net worth. While President Trump frequently takes credit for the recent success of the economy, do investors give him credit for the economy? Depends, as usual, upon one’s political affiliation … but Independents and begrudging Democrats may at least agree that the economy is doing well. More than half of investors (52 percent) believe that their financial situation is better than a year ago. Sixty percent of Republicans believe they are better off financially as do 48 percent of Independents and 47 percent of Democrats. Similarly 54 percent believe they will be better off a year from now. Sixty-four percent of Republicans and 50 percent of Independents as well as 48 percent of Democrats reflect this feeling. When asked their feelings about the Trump administration, 26 percent of investors indicated they support the current administration while 33 percent indicated they despise the current administration. A moderate 55 percent said they are interested to see what Trump and Congress can agree upon. Sixty-one percent of Republicans, 53 percent of Democrats and 51 percent of Independents took that stance. It seems that while a specific portion of investors may dislike President Trump, they are at least willing to acknowledge that the economy is doing well.